Images not clear or text you can see in the images, I'll have to deal with that later when I have time. William Frank Skinner was a prolific inventor during the early 1900’s. He was the proprietor of Skinner Manufacturing Company, Inc., in Miami, Florida. His inventions include a toy moving picture camera, refrigerated water cooler, pulsed alkaline battery rejuvenator, amongst many other inventions. 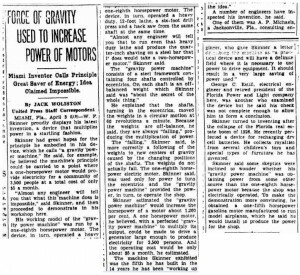 One invention that made the national news, but apparently immediately disappeared because of its highly disruptive nature is his Gravity Power Machine. There are no patent or other documents relating to this and only old newspaper copies make any reference to it. And, an obscure video in some British archives, which you can see here: GRAVITY POWER! - British Pathé and video stills are available here: Video Stills: GRAVITY POWER! - British Pathé. The basic claim is that Mr. Skinner is inputing power from a 1/8 HP electric motor and the output is claimed to be multiplied by 1200%. The output is going to a belt driven lathe and a couple other shop tools that would normally require several horsepower to operate. All that work performed for less than 100 watts. Input is 1/8 HP electric motor. Geared up input wheel is belt driven from the Input Motor from a 1/8” diameter cotton thread. Input geared up wheel drives a belt that turns the Lever Mover, which moves the four levers back and forth. The first three steps are simply to move the Input Levers back and forth primarily with a bit of rotation at the top of the lever. This could obviously be done in a number of ways. The back and forth is the primary motion and the slight circular motion of the level from the top increases the effectiveness of the primary mechanism. My proposed method would be to have a Scottish Yoke assembly to convert rotational movement from a prime mover into linear back and forth movement. There are all kinds of speed controlling mechanisms available today that Mr. Skinner did not have so we should be able to greatly simplify the lever action. And of course we want a lever long enough so that the smallest input is leveraged to the max. 4. All the real action starts by the Input Lever rocking back and forth and having that movement leveraged slightly below the pivot point at the bottom. 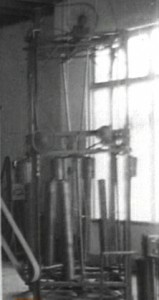 In the video, the lever is not solidly locked to the spring clamp as there is some “give” in both directions. It appears there is some sort of “give” mechanism such as a spring, leaf spring or other setup to possibly act as a dampener but also to assist in the leverage process. The spring clamp may be directly connected to the pivot and the lever may possibly be simply clamped in the clamp. Although this is speculation, it does not take away from the observable fact that the bottom of the lever is moving the swivel bracket. The spring clamp doesn’t appear to be necessary for the primary operation of the machine but is there to enhance the functionality. 5. Looking closely at the swivel bracket, we can see that the diameter of the lever connection is smaller than the lever. So, it is possible that it is the same rod that is simply machined to a smaller diameter for practical purposes for fitting into a bearing in the bracket, or, the lever is disconnected inside of the spring clamp and a separate smaller diameter rod extends from the spring clamp down to the swivel bracket. This lower lever connection is one of three apparent connections to the bracket. The other two are a fixed connection to the upper cylinder weight, which rotates with the swivel bracket. And the other is the lower eccentric wobble shaft, which is connected to the bracket and the bracket freely rotates around this lower shaft. This swivel bracket is where all the real action happens. As the cylinder weight that is fixed to the swivel bracket swings around in a clockwise direction (from a top down view), its momentum obviously has a tendency to keep it swinging in a circle. This is very important. 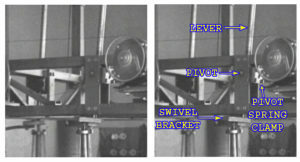 When the lever is pushed in one direction, it is pushing one corner of the square swivel bracket and that moves in unison with the weight moving in a clockwise direction and when the momentum of the weight pulls it around towards the other direction, it helps to pull the corner that the lever is attached to in the opposite direction. What this means is that the back and forth reaction of the lever is translated into rotational motion of the swivel bracket. And that shows us that the reaction of the back and forth helps keep the upper weight rotating in the same direction without it being opposed. Furthermore, as the upper weight is pulled in a circle, it reinforces the lever’s input instead of counter it. What we have here is an example of an apparent violation of Newton’s Third Law of Motion where the reaction actually assists the machine to perform in the forward direction instead of countering any movement. This is consistent with other known working mechanical amplifiers such as Veljko Milkovic’s 2-Stage Mechanical Oscillator and Fernando Sixto Ramos Solano’s Force Multiplier System where all the reaction in the system is diverted in a way so that it assists the system’s function in the forward direction. 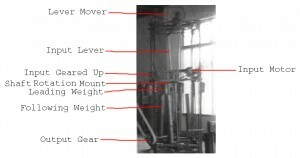 As there is energy dissipation by the rotating upper weight, the lever only needs to input enough to make up for the loss in momentum of the weight, which is very little. Therefore, for a very small periodic input, two times per full rotational cycle, we are getting the full amount of work from the very heavy weight.